Dorothy Earnshaw was a Red Cross nurse (VAD) based at the Manor House Hospital, Folkestone during the First World War. I first heard of Dorothy when I started helping local WW1 charity Step Short to update content on their website. 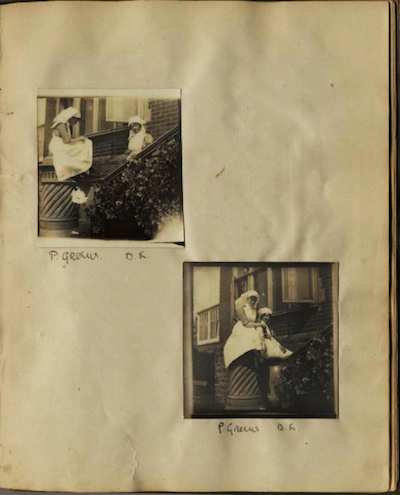 Hidden among the pages of educational resources was a digitised copy of Dorothy’s friendship album; not just an autograph book but a wonderful, personal and poignant record of one woman’s Great War. Folkestone Library holds the original so I went along one morning to have a proper look. It’s amazing to me that we can touch something today that so many people held 100 years ago, and something that was surely treasured. Holding the original hardback notebook (much smaller than I imagined) in my hands, and carefully leafing through the pages of handwritten poems, letters, sketches, signatures, newspaper cuttings and photographs, I wanted to know much more. Where had Dorothy come from? What friends did she make at Manor House? Did she fall in love there? Who did she stay in touch with from her time at the hospital? What was life for Dorothy like after the war, and in what ways did it affect her? Did she marry or have children? How did the book end up in the library? And what about all those men who wrote in her album? According to Red Cross records, Dorothy Russell Earnshaw signed up in Wimbledon, Surrey and served for two periods in Folkestone between June 1916 and September 1918. Her friendship book appears to begin in November 1915 though, when she was 22 years old. There are many cheeky or ‘standard’ comments or rhymes in the album as well as heartfelt messages from a wide range of Allied servicemen. Tucked away in the original book is a newspaper article about an underage Welsh soldier, Clifford Probert, who signed up under a false name (William Gordon Williams). Williams served bravely and was promoted to Lieutenant and awarded a Distinguished Conduct Medal (DCM) before losing his memory and disappearing from Harefield Military hospital in Middlesex on 9 February 1916. He was eventually found in Darlington at the end of the same month. Along with the newspaper cutting, Dorothy has a handwritten letter from a Lieutenant G Williams DCM, inviting her to meet up with him in London…how did their paths cross? And what happened between them? Dorothy – maybe people called her something more informal like Dottie, Dory or Dolly – was clearly the object of many servicemen’s affections, and huge gratitude. It must have been a unique and life-changing experience for all of them. In her photographs she looks fun and very cute; I’m sure there were all sorts of romantic shenanigans. After some free online digging, I discovered that Dorothy was born on 6 March 1893 in Bromley, Kent and baptised on 15 April the same year at St Stephen’s, Clapham Park, London. Her mother was Clara Marzetti (born in Wandsworth) and her father, a Clapham-born Surrey cricketer and wine merchant, George Russell Bell Earnshaw. It seems that he died, intriguingly, in December 1894 in Merano, Northern Italy aged just 37. I wonder how he died and in what circumstances his family then found themselves? Interestingly, in the 1901 census, Dorothy was listed as a paying guest at 17 Christchurch Road, Folkestone, the seaside town in which she was to spend much of the war. By 1911, she was living at 86 Kings Avenue, Clapham Park South in London, with her grandmother Julia Marzetti, her mother Clara Earnshaw and four other women. This house no longer exists but is likely to have been a large property, as this was an affluent area and in 1930 was substantial enough to become a children’s home. The other women were possibly lodgers or servants, depending on the ladies’ financial situation – I didn’t part with any cash so didn’t have full access to these records! With my amateur tracking skills, the next sighting of Dorothy I found after the war was in 1929, when she lived at Park Road, Farnham in Surrey. Then in March 1931, aged 37, she married a Mr Howard Shaw Savill. He was 59 or 60 years of age on his wedding day and it doesn’t look as if Dorothy ever had any children. She was widowed in July 1954. Both during and after her marriage she seemed to enjoy a rather jetset lifestyle, with her name (Dorothy Russell Savill) popping up on all sorts of international cruise passenger lists. Dorothy died in Eastbourne, East Sussex towards the end of 1979, aged 86. I find these little morsels of information about Dorothy’s experiences absolutely fascinating and would love to delve deeper when I get the chance. She was just one young woman, yet her little book and life story can tell us so much about people and the 20th century world.